I don’t know it it’s simply fortuitous timing, or if Clint just saw (the fairly successful) Moneyball and gravelly though, ” Hey, I could do that,” but looks like he’ll be doing a new baseball picture. Even more interesting is that Trouble With The Curve will be the first film in nearly 20 years that Eastwood stars without directing. Instead, he’s handing off those duties to his producing partner Robert Lorenz (who has assisted or second-unit directed many of Eastwood and other’s films), as he steps into a role written by Randy Brown about a baseball talent scout. The story has Eastwood’s aging scout embarking on a sort of “one last job” as his vision is failing, but he needs to investigate a prospect in Atlanta. His daughter joins him on the ride to the south, and I assume much soul-searching and grumpiness occur. There will also probably be a few scenes of blurry vision attacks! with lots of squinting Clint close-ups. Perhaps the film will end with Eastwood clicking on the radio (or quaintly fumbling with an assistance-enabled laptop) next to his recliner as he hears his new boy crack a home run. 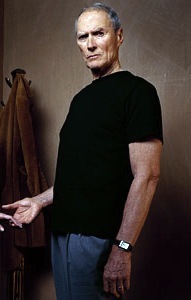 I’m poking fun, but it will be cool to have Eastwood starring in a film again, and doing so under someone else’s eye. Hopefully the script is an interesting one, and not the kind of schmaltz-fest that a story like this can so easily become. Frankly, it’s a coin toss with projects that Clint would pick nowadays. This project could very likely be Eastwood’s next, as (ironically) A Star Is Born is on hold while Beyonce focuses on gestating and birthing Jay-Z’s 100th problem.